Forensic science has moved criminal investigations beyond interrogations, according to a New York professor who spoke at Indiana State University. Richard Li, an associate professor of forensic biology at John Jay College of Criminal Justice of the City University of New York, explained his experience as a forensic biologist, using photos, along with discussing his research in the field. Forensic science combines scientific skills, knowledge, and techniques as well as analyzing forensic evidence in a laboratory. Li, a forensic biologist, explained that forensic science wasn't always available in the past so biologists used interrogation techniques to try to solve a crime. Now, to solve cases crime labs in the United States use eight different units, including firearms, documentation, photographic, toxicology, fingerprint, evidence collection and biological units. Li explained how forensic biologists determine whether the crime scene is a primary or secondary scene. A primary scene is the location the victim was actually killed while secondary scene means the victim was killed at one location and then the suspect dumped the body at another location. "Knowing the primary scene is more helpful in terms of looking for more evidence," Li said. He offered suggestions on where to start looking for evidence. "If the perpetrator has enough time, he will clean the blood patterns, so we need to look for focal points," Li said. "The blood has to go somewhere so we look for any other remaining fluids and we are able to get some DNA evidence so the focal point can be useful." Li said most of the evidence can be found at the suspect's entrance location, pathway of movement and point of exit. Once evidence has been located, he discussed several techniques that can be used to process the evidence.Alternate light source (ALS) or luminol is used to identify blood stains that are invisible to the "naked eye" and seminal stains from sexual assault cases. A Cutter Acid test is used on sexual assault cases to identify salvia from a bite mark on a victim's body. "White area indicates it is positive for saliva stains," Li said while pointing to a photo. Another examination that biologists use is a blood stain pattern analysis where measurements and calculations are taken to find a point of origin which tells biologists what position the victim was in when he or she was attacked. "We can get a very good crime scene reconstruction," Li said. Once evidence is collected from a crime scene, Li explained how investigators piece together the evidence to solve a case. "We solve cases by establishing the linkage between the victim and the crime scene and the suspect and the crime scene, and by physical evidence at the location," Li said. The speaker series, sponsored by the ISU department of biology and St. Mary-of-the-Woods College science and math department, brings in internationally recognized research scientists to speak to students and community members. On Feb. 3, the Tri-Beta Speaker, Craig Nelson from Indiana University, will speak on "Evolution, Creation or Both' Big Macs, Double Elimination Tournaments, and Bowling Isn\'t Football: The Scientist's Lot Is Not a Happy One - Or Is It'" while on Feb. 10 in celebration of Darwin Day, Tom Seeley from Cornell University will speak on "Honey Bees and Effective Decision Making." 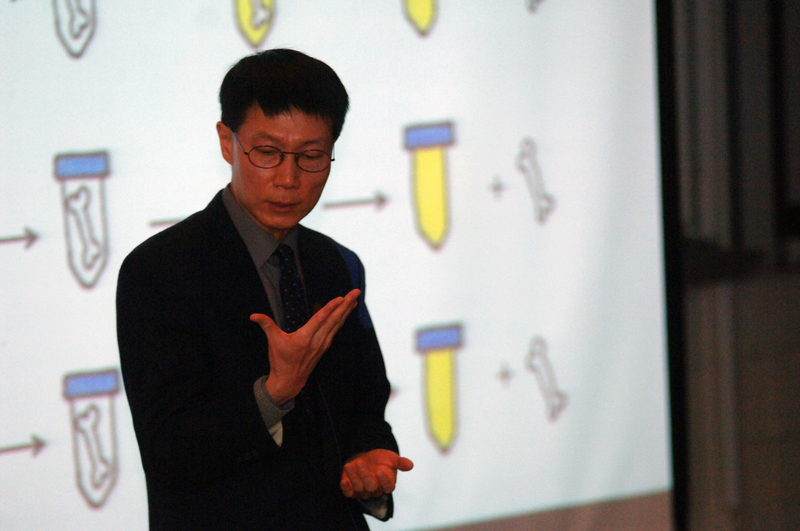 Cutline: Richard Li, an associate professor of forensic biology at John Jay College of Criminal Justice of the City University of New York, speaks to Indiana State University students about forensic biology techniques and research.